Nobody understands the art of craft beer better than Stone Brewing. What started as a small-time brewery in San Diego has turned into an international empire that launched a craft beer revolution. Recognized as an early pioneer of the craft beer industry, Stone Brewing’s influence and success have cemented them as an icon of San Diego’s beer culture. Stone Brewing founders Greg Koch and Steve Wagner took a drastically different approach to brewing beer—it was bold, irreverent, and unapologetic. Their flavorful, hop-centric brews caused a seismic shift in the craft beer industry. The pervasive IPA craze is a testament to Stone Brewing’s lasting influence. Motionstrand first began working with Stone Brewing in 2013. In late 2015, we broke ground on our biggest collaboration to date: a complete overhaul of Stone Brewing’s main website. Motionstrand complemented Stone Brewing's brazen attitude with a completely custom, built-from-scratch website with a streamlined design and intuitive user experience. 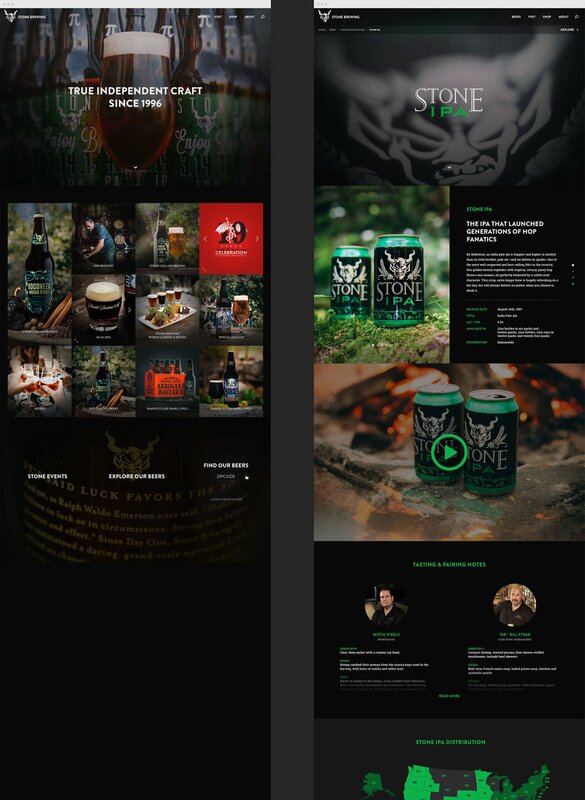 Building a website from the ground up takes preparation, we spent months immersing ourselves in the Stone Brewing brand. We needed to create an online experience that embodied Stone Brewing’s personality, while resonating with their loyal fan base. Using Drupal as a foundation, our team of developers tailored the new CMS around Stone Brewing’s needs. Third party distributor databases and APIs were custom-made and fully integrated. 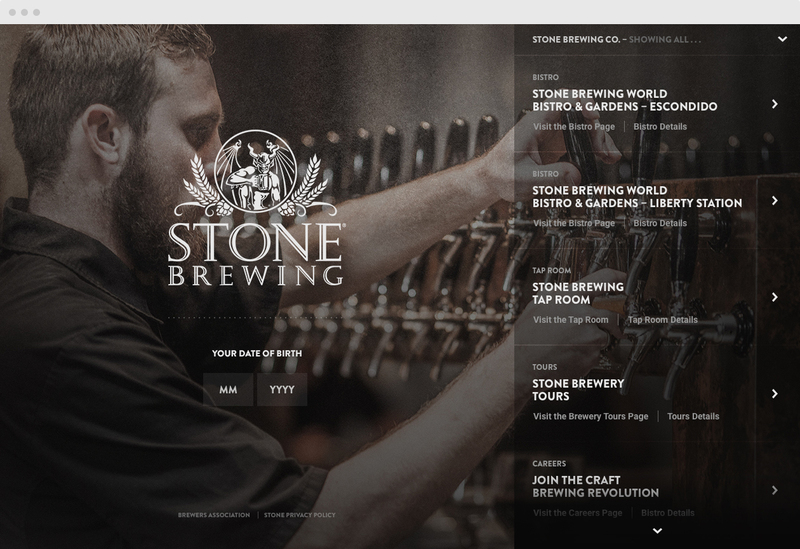 The new stonebrewing.com combines the best in front-end user experience and back-end functionality. For Stone Brewing, beer is just the beginning. In true Stone style, their World Bistro and Gardens feature an eclectic menu that goes beyond traditional farm-to-table-fare. Their philosophy on food is a lot like their philosophy on beer: freshness and sustainability above all else. Motionstrand created a custom age gate for Stone Brewing, for a better user experience and easy access to their most-visited pages. This solution provides users with a direct link to Stone Brewing’s most popular pages, putting the most pertinent information front and center. This custom design also lets users bypass the age gate on the World Bistro and Gardens pages because, luckily, there’s no age limit for having good taste. Locating your favorite Stone beer is just a click away with the Stone Beer Finder. This Beer Finder is more than just a pretty interface. Motionstrand developed a search engine for Stone that's fully integrated with delivery databases nationwide. 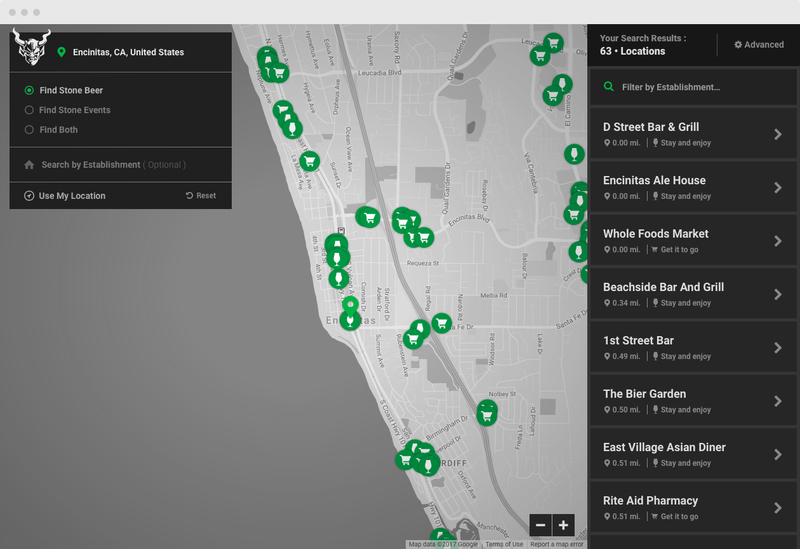 Users can search for a specific beer to track down a local retailer or restaurant that stocks their favorite brews. Every year, 50,000 beer fanatics tour Stone’s Escondido brewery. With the new Stone Tours page, booking a tour is easier than ever. 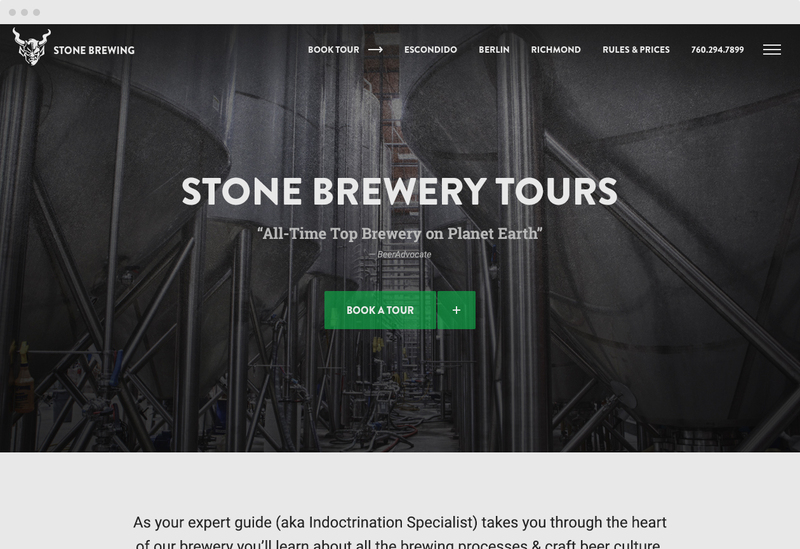 The Stone Tours page was in need of a major facelift. Before the launch of the new stonebrewing.com, scheduling a brewery tour could only be done over the phone. Motionstrand built a custom tour-booking tool with a user-friendly calendar view, each day of the week displays the tour times and availability. Motionstrand knew from the very beginning that a “good” user experience wasn’t good enough— stonebrewing.com needed a fresh, completely custom design with intuitive navigation. Our pixel-perfect attention to detail paid off, after the site’s launch traffic grew considerably. From November 2015 to November 2016, Stone Brewing saw an 832% year-over-year increase in educated beer users.